Bledlow Ridge had its first chapel-of-ease in 1801 to the north of the village. It was replaced on a more central site in 1834. 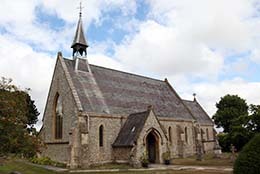 The second chapel was replaced by the current church opening in 1868, designed by the architect David Brandon. It is a plain but bright building of flint walls with stone dressings, at a time when brick dressings were more common in the Chilterns. The side windows of nave and chancel are all Early English lancets, but E and W windows have Geometrical Decorated tracery. Introduction to Stained Glass: Just 3 windows have stained glass, but all are notable. They are windows by Mayer & Co, Geoffrey Webb, and the largest window in Buckinghamshire to be designed by John Piper and made by Patrick Reyntiens. 01 East 3 lights The Good Shepherd 1904 Mayer & Co.